The winter storm that hit Paynesville last Monday night and Tuesday delivered nearly two feet of snow, one of the largest single snowfalls ever in the Paynesville area. The winter storm that hit Paynesville last Monday night and Tuesday delivered one of the largest single snowfalls in the Paynesville area, according to experts who remove the snow. Mel Jones of Paynesville Excavating has hauled and plowed snow for 42 years and can never remember getting so much at once. "I think it's worse than '75," agreed Joe Kremer, another long-time resident and member of the city maintenance crew. A house on South Street had a hard time seeing out of their front window as the snow overhang from the roof nearly touched the snow drift on the ground. Bub Hartmann, who has plowed the city streets since 1957, said the area might have gotten as much snow before at once, but previous snowfalls of this magnitude were light snows from Canada Clippers that were "half as hard to plow." Because of the snow and drifting and the lack of a local weather expert, the actual amount of snow that fell will never be known exactly. St. Cloud reported getting about 14 inches of snow and Willmar got nearly 30 inches. Paynesville is somewhere in between. Certainly the area got 20 inches. It's more than likely we got at least 24 inches. Jones even heard one report of 27 inches. "It's hard to tell," he conceded. "We had a lot of snow." The snow disrupted all activity on Tuesday and continued its influence the rest of the week. Nurses stayed overnight at both the Paynesville Area Health Care System and the Good Samaritan Care Center on Monday night and worked another shift on Tuesday before heading home. Some employees even came prepared on Monday night by bringing pajamas with them to work. School let out early on Monday, was cancelled on Tuesday, and started late on Wednesday. Only two percent of the mail deliveries were made on Tuesday in Paynesville. The only mail that got delivered was to downtown businesses and houses near the downtown area, said postmaster Dan Severance. Only 50 of the nearly 2,500 drops in the city and the rural routes got mail on Tuesday. 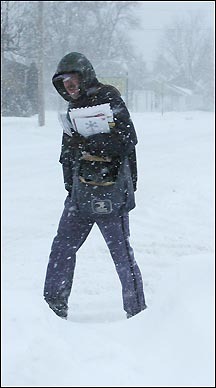 Jeff Mackedanz delivered some mail on a route around downtown Paynesville while the snow flew on Tuesday. The post office has delivered mail just in the downtown area five times in the past 23 years, according to former postmaster Harold Morris. Only twice has mail not been delivered at all because the trucks bringing it from St. Cloud didn't arrive. Regular mail delivery resumed on Wednesday, added Severance, except to mailboxes that were damaged by plowing or buried in snow. The area got so much snow at once that snowplowers worked to clear it for days. Kremer started plowing on the city streets at 2 a.m. on Tuesday morning, as usual. An hour later he called another crew member, Bob Wander, and by 4 a.m. they had called Ron Mergen, public works director. Normally it takes four hours for the city crew to clear the downtown streets, but last week it took 26 hours. Hartmann said they plowed the city streets the first time in seven hours. Usually it takes four hours with two rigs and up to six hours with a heavy snow. But they had to plow again because the snow kept falling. "We had a foot of snow after we plowed (the first time)," said Hartmann. "We had to redo and redo and redo." Snowplowers, like everyone who shoveled or used a snowblower, discovered that the snow was heavy and difficult to move. "Oh, it was heavy," said Mergen. "When you took off the top layer, the bottom four inches turned to water. Then when you took that off it turned to ice." Part of the problem downtown was getting traction to blow the heavy snow into trucks, so it could be hauled out of town. 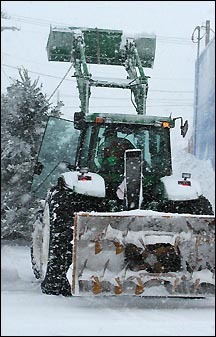 The city crew also uses chains on its skid loader to gain traction when moving snow. Last week, two sets of chains broke because the snow was so difficult to move. "It was bad snow," explained Hartmann. "Heavy. Awful hard to plow. Anyone who has a snowblower can tell you the same thing." "It's about the worst snow we ever worked with," agreed Jones. Just like shovelers who found half the snow sticking to the shovel, hauling the snow was more difficult because snow stuck to the bucket when loading and in the back of the truck when dumping. Another difficulty was that winter arrived with a blast, with little cold temperatures in advance. As a result, the ground under the snow was not frozen. This made it difficult for the city crews on gravel alleys and any street without curbs. "If you get off the black top, you dig up the ground or grass," explained Jones. Bob Brauchler of Corner Floral lifts the Christmas tree back into place in the Kindness Garden after it was blown over by the winds. Hartmann added that the snow was so heavy that it sucked the heavy equipment off the road. 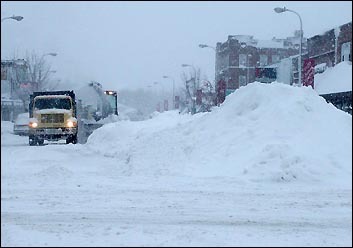 City crews and contractors worked throughout the work week to clear the snow. "We're still not done," said Mergen on Friday. "We've still got a lot of intersections to clean out. A lot of side streets to widen." Jones and his crew were still hauling snow on Friday as well. "The fun," he understated, "kind of wears off after a couple days." The city hauls its snow to the Setterberg turkey farm on the other side of the river. "We've probably got as much out there now as we usually do all winter," said Jones on Friday. Hartmann was planning to plow again on Monday. Aided by the warm temperatures, he hoped to cut some of the ice from the streets. Jones reminded the public to be cautious when driving near anyone working with snow. The plower is likely to be concentrating on moving the snow, and the driver needs to be responsible and not get in the way. Hartmann agreed that the amount of overnight traffic has greatly increased over the years. "Years ago," he explained, "we'd go out at night and not see a soul." Still, despite all the phone calls from residents and all the work last week, Mergen was pleased with how things went. "Considering how tough the snow was, I think it went pretty well," he said. "Residents, for the most part, were cooperative and patient." According to Press records, these are details from some of the severest winter storms to hit the Paynesville area in the past 60 years. This blizzard came on the heels of mild weather and caught the state by surprise on Nov. 11, 1940. 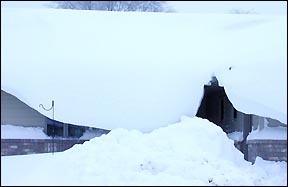 Snow and strong winds created snowdrifts 18- to 20-feet high, including blocking the Highway 23 tunnel under the railroad bridge east of town. The storm hit the entire state, except for the southeast corner, and cost the state $250,000 to clear 10,000 miles of state highways. Five snowstorms hit the area that March, and the area's snowfall total hit 93 inches for the winter, rivaling 1888 and 1917 (87 inches of snowfall) as the snowiest winters. Paynesville received 25 inches of snow over three days in early March as a slow-moving storm sat over Minnesota and dumped snow. School was closed for five days, and some county roads were still blocked a week later. The U.S. Army sent units to help feed turkeys on farms in the area. The storm on Jan. 16, 1975, was called the blizzard of the century and was the worst since 1888, according to news reports. The storm started on Thursday and Friday and was the worst on Saturday. School closed early both days and didn't reopen until Tuesday. Eighteen inches of snow were blown by 70-mph winds. Electricity went out in Hawick, and 25 people were housed in city hall in Paynesville. While the Twin Cities got 28 inches of snow and Duluth got 34 inches, the Paynesville area escaped with only 13 inches of snow from this early-season snowstorm.